San Francisco’s Outer Sunset neighborhood is largely unfamiliar to tourists, and even to many locals. Nestled on the edge of the Pacific Ocean and untouched by the tech boom, the area retains its laid back California vibe despite the city’s cultural shift. Corner grocery stores, surf shops, bars, quirky cafes, ethnic restaurants, auto repair shops and pizza joints line the main drags of Irving, Judah, Noriega and Taraval Streets. For me, the neighborhood’s crown jewel is Tunnel Records & Beach Goods, one of the best places in the Bay Area to feed my lifelong record buying habit. When I discovered Tunnel, I figured whoever opened the place must have a gambler’s spirit. People come to this area either to go the beach or to come back home; it’s not exactly a famed retail, culinary, or entertainment destination. No bother for Ben Wintroub, Tunnel’s co-owner along with his wife Andrea. In early 2017, after a few decades of dreaming of running a record store, they broke ground at 3614 Taraval Street. But the venture involved more than finding a space and filling it with product. The uncontrollable forces of life had to align in the same direction. Before Tunnel was even on their radar screen, Ben and Andrea were chasing another dream: They were planning to move to Portugal, where Andrea spent much of her youth. With her dad still living there, they wanted their two young daughters to spend more time with their grandfather. Real estate agents were on the hunt for their new home. But aspirations – be it completing a triathlon, becoming a teacher, or learning how to paint – often have their own hands on the steering wheel as we ride shotgun. Rather than moving in a linear fashion toward our destination, in many cases we can only react to the unexpected twists and turns in the road. One morning Andrea came across an ad on the Multiple Listing Service (MLS) that altered their course. A dry cleaners in the Outer Sunset was for sale, and the space was available. Ben and Andrea immediately connected the dots: Here was the opportunity that had eluded Ben for years. He could walk to work, one of his requirements for a store. The right space in the perfect location became available at the ideal time. Completely aware of the risk, they took the money intended for the move to Portugal and applied all of it to constructing, designing, and stocking the shop. The business is a true partnership. Andrea, a successful entrepreneur herself, runs the “Beach Goods” aspect of the store. 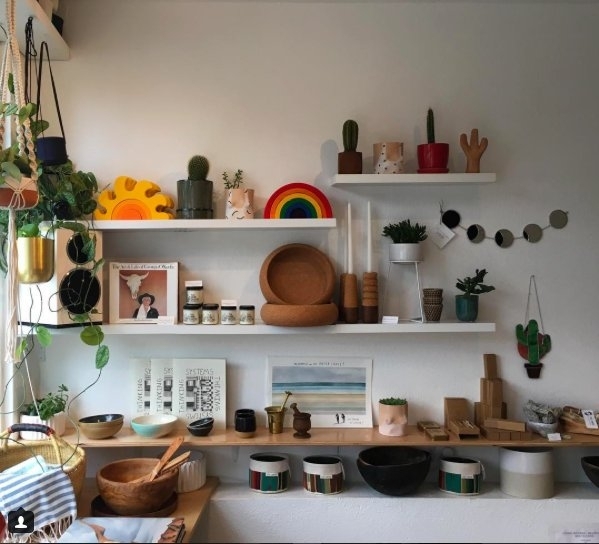 So as you peruse an uncommon selection of jazz, funk, rock, soul, blues, international and reggae records, you’re surrounded by lovely displays of ceramics, greeting cards, handcrafted wood bowls, esoteric magazines, plants, weaved beach bags, and other interesting items. The eclectic nature of the store provides an unintended business strategy, in that the beach goods draw clientele who wouldn’t otherwise walk into a record store. They get exposed to the joy of records and come back for deeper musical exploration. “I’ve seen people widen their musical tastes upon repeat visits”, says Ben. “Some start with a familiar classic rock type of album, but they’re now diving into jazz and international stuff. It’s gratifying to watch people expand their tastes and for me to be a small part of it.” Ben’s humility is just one reason why it’s such a pleasure to shop at Tunnel. An observer could claim that, although Ben should be lauded for his accomplishment, he did have the pedigree and support from Andrea. But fear, crippling self-doubt, and pure laziness prevent even the most privileged from pursuing their goals. Ben, on the other hand, had the twin qualities that separate daydreamers from entrepreneurs: The motivation to go after his goal, and the willingness to take a major financial risk. Before Tunnel, his job as real estate appraiser provided a nice and consistent income. That’s not easy to give up when you’re married with two young children in the most expensive city in the country. As any record junkie knows, the search provides much of the thrill. And the greatest pleasure isn’t always about finding what’s on your list – it’s taking a chance on an unknown album and realizing by the second track that you scored a gem. That may not be as dicey as quitting your job to open a record store but, as we’ve learned from Ben’s story, extraordinary results only come with extraordinary risk.